If you’re looking for a good Total security for your PC that provides multiple layers of protection for everything you do online, then the new Defender Total Security 2011 is a good option.BitDefender Total Security 2011 offers comprehensive, proactive protection, system maintenance and backup, all without slowing down your PC. As you all know, the BitDefender Total Security 2011 gives your PC fast, proactive protection against the latest viruses, spyware, and identity theft attacks, all in a friendly and customizable dashboard. . It offers system maintenance and backup, without slowing down your PCs. 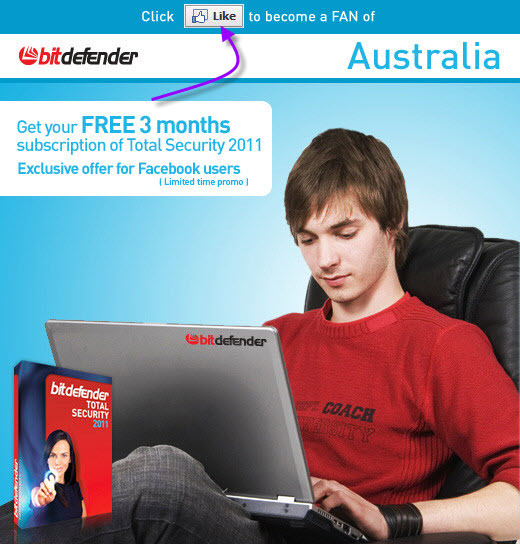 BitDefenderis offering a free 3 months valid license for BitDefender Total Security 2011 License as a promotional offer . To grab your free license, just enter Promotion page here and follow instructions.